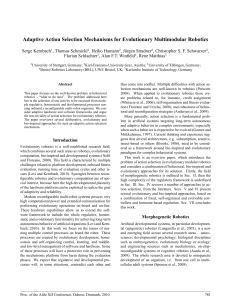 design parameters for different locomotion patterns have been calculated that they can be replicated in similar robots immediately. peristaltic motion to sneak through a narrow hole. construct diverse types of robots, including caterpillar robot. robot fits for application of coordinated locomotion. robot are hand-planned  and lack generality. the capability of animals like armadillo. Section 5. Finally Section 6 concludes the paper. Figure 1: Multipattern locomotion examples. Figure 2: Kinematics model of UBot module and topology of composed caterpillar robot. employed to generate rhythmic locomotion for robots. 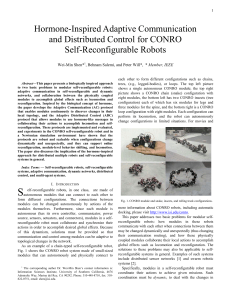 advantage in controlling modular robot compared with sinebased controller. the greater the amplitude 𝐴 is, the higher the speed is. four modules in a full waveform. Figure 3: UBotsim—3D dynamics simulator. where 𝑖 is module ID and ID increases from head to tail. of the proposed strategy, a dynamics simulator is required. vibrates at the joint offsetwhich is always set as 0∘ . different values are discussed below. are set as 𝐴 = 30∘ and Δ𝜙 = 𝜋/4 (𝑚 = 9). this situation, waveform does not resemble the sine curve. millipede-like locomotion when 𝐴 = 90∘ . collision would not happen throughout motion procedure. 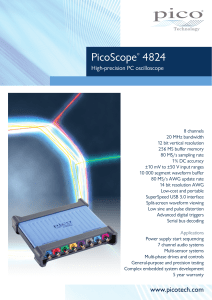 are set as preferred amplitudes scope. Figure 4: Locomotion mechanism of caterpillar robot in sine-waveform. Figure 5: Caterpillar-like locomotion of 16-module robot. Figure 6: Millipede-like locomotion of 16-module robot. Figure 9: Amplitude design reference in sine-waveform motion. formula (2), this can be a reference graph for planning sinewave locomotion for series of caterpillar robot. deviation of Δ𝜙 from 𝜋; that is, (𝑚 − 1) ∗ (𝜋 − Δ𝜙) = 𝜋.
larger than 6, the longitudinal effect becomes apparent. 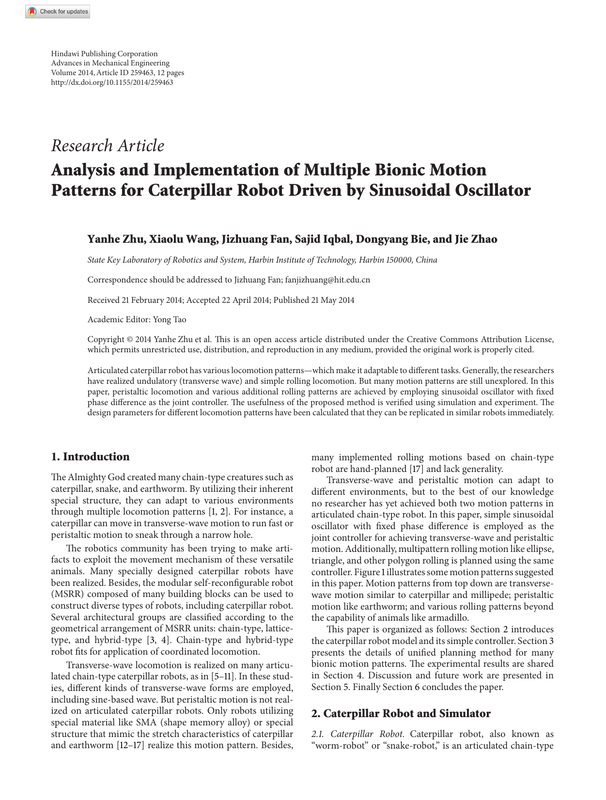 Figure 10: Peristaltic locomotion mechanism of articulated caterpillar robot in longitudinal waveform. Figure 11: Peristaltic mechanism of earthworm  and a simulation based on 16-module articulated caterpillar robot. Figure 12: Conceptual model of locomotion in closed-loop type. Figure 13: Elliptical states correspond to different values of amplitude. Figure 14: Rolling in polygon shape. + ⋅ ⋅ ⋅ + sin (𝑤𝑡 + 𝑛 ∗ Δ𝜙)} . The expression value in the braces should be zero all the time. 𝑚 = 2, 3, 4, . . . , [ ] . (ii) If 𝑚 > 2, robot shape looks like a polygon of 𝑚 edges. shows a few screenshots of robot in polygon shape. robot; that is, triangle is more stable. Figure 15: Collision example and collision analysis. Figure 16: Amplitude references for motion in ellipse and triangle. the distance from joint 𝑥 to joint 1 must satisfy formula (8). where 𝐿 is the length of module-edge. number of edges 𝑚 ≥ 4, maximum amplitudes is 90∘ − Offset. curve and a straight line are more stable. 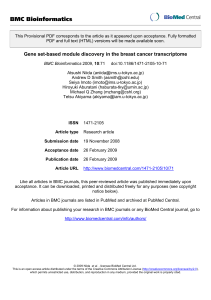 Figure 17: UBot MSRR experiment system. mechanical connecting mechanism mounted on link-face. Figure 18: Experimental screenshots and body-center changes of caterpillar-like pattern. Table 1: Parameters set for experiments. experiment screenshots and position changes of body-center. planar environment by enlarging angle speed. process is more like a millipede. Figure 19: Experimental screenshots and body-center changes of millipede-like pattern. Figure 20: Experimental screenshots and body-center changes of earthworm-like pattern. Figure 21: Experimental screenshots and body-center changes of elliptical rolling pattern. Figure 22: Experimental screenshots and body-center changes of triangle rolling pattern. adaptability. That will be our future work. be replicated in other analogous robots immediately. regarding the publication of this paper. University Press, Princeton, NJ, USA, 2003. Mechanical Engineering, vol. 57, no. 2, pp. 59–64, 2013. Magazine, vol. 14, no. 1, pp. 43–52, 2007.
and Automation Magazine, vol. 17, no. 3, pp. 38–55, 2010. ’09), pp. 1041–1046, May 2009. Conference on Robotics and Automation (ICRA ’12), 2012. Mechatronics, vol. 10, no. 3, pp. 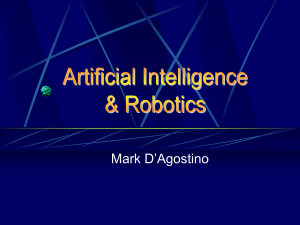 314–325, 2005.
International Journal of Advanced Robotic Systems, vol. 10, 2013. ’04), vol. 4, pp. 3282–3287, May 2004.
vol. 13, no. 3, pp. 566–569, 2004. Industrial Robot, vol. 36, no. 4, pp. 358–364, 2009.
and Actuators A: Physical, vol. 125, no. 2, pp. 429–437, 2006. 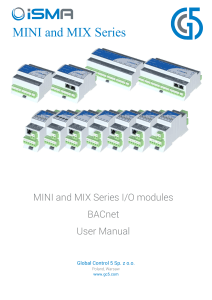 IEEE/ASME Transactions on Mechatronics, vol. 18, no. 5, pp. Conference on Robotics and Automation (ICRA ’11), 2011. 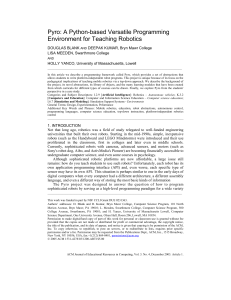 Industrial Robot, vol. 39, no. 2, pp. 178–190. Natural Science, vol. 19, no. 12, pp. 1821–1829, 2009. 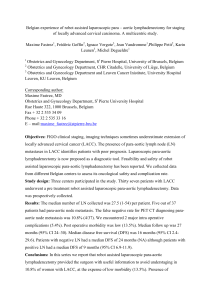 Belgian experience of robot assisted laparoscopic para – aortic lymphadenectomy... of locally advanced cervical carcinoma. A multicentric study.